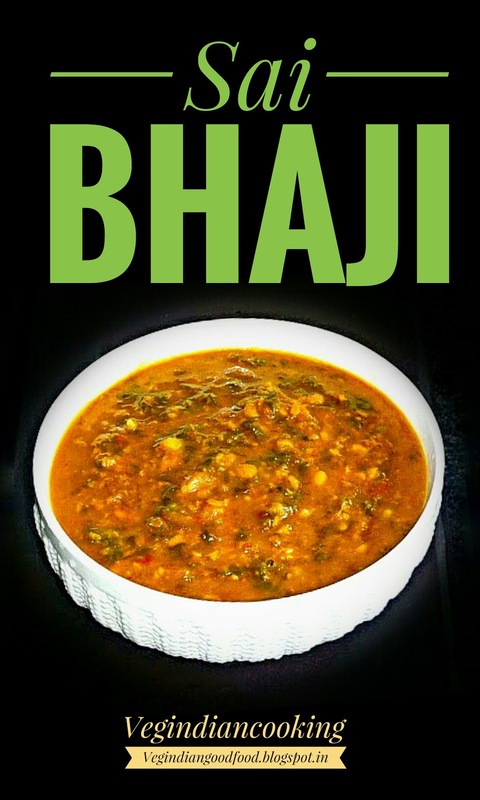 Sai Bhaji is a very famous, awesomely delicious, healthy, religiously cooked and most preferred green leafy vegetable dish from Sindhi cuisine. This dish is an excellent combination of green leafy vegetables and chana dal - split Bengal gram... which provides plenty of calcium, protein, iron and vitamins. The term Sai Bhaji means green vegetable as the base of this recipe is combination of green leafy vegetables, as we mainly add good quantity of Spinach leaves. 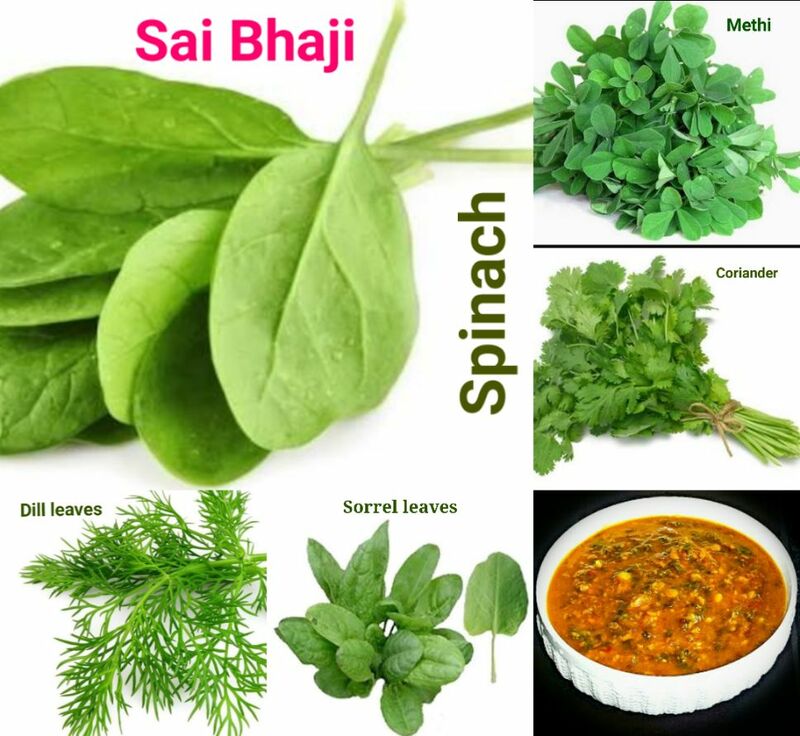 Along with palak (spinach) other green vegetables are also added such as Dill leaves, Fenugreek Leaves, Coriander leaves and Sorrel leaves. Botanists know it as Rumex vesicarius (Khatta Palak) also known as Chuka in Hindi, Chukoo in Sindhi, Amlavetasa In Marathi, chukkakura in Telugu, chukkankeerai in Tamil and hammaaz in Urdu. Take a little bite of a leaf and it will reveal its true identity. 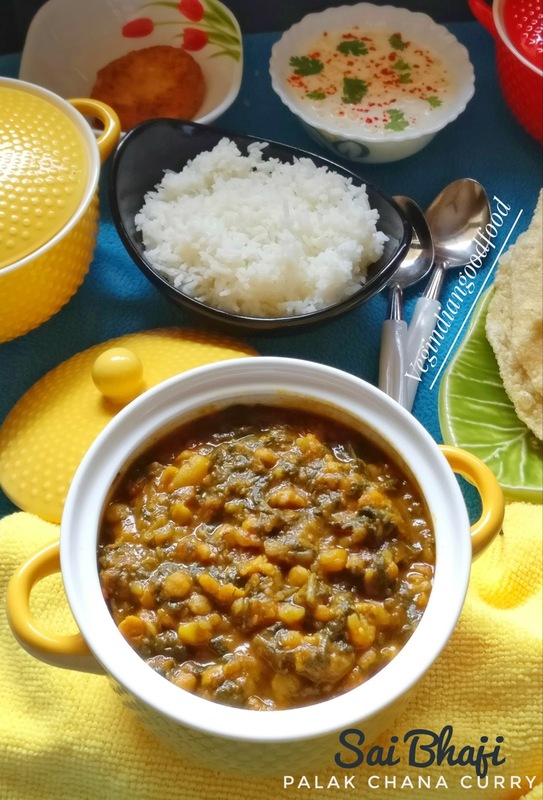 The tart, lemony flavour of khatta palak makes this stand out from its similar-looking cousins. 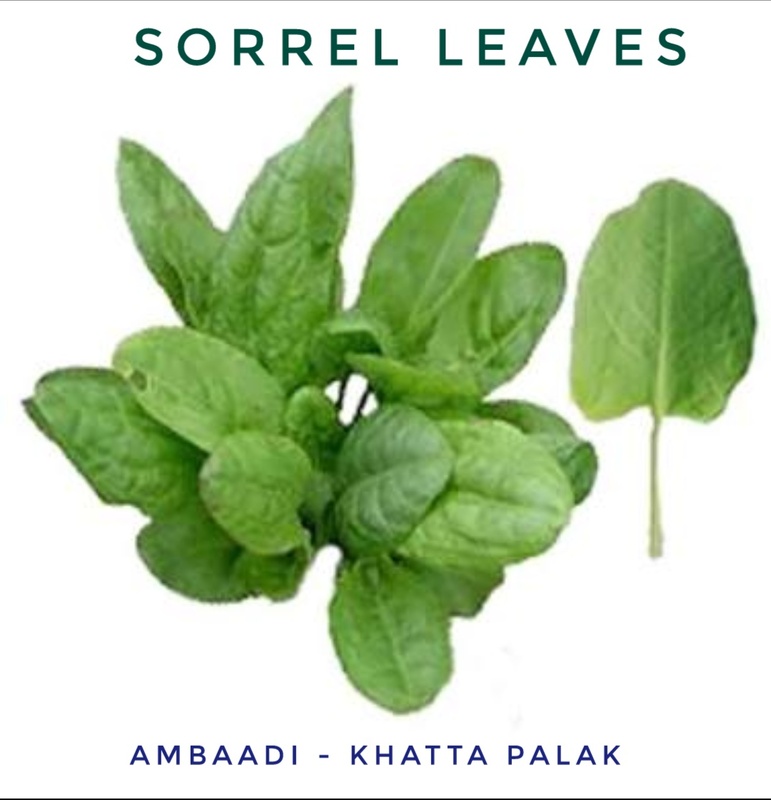 If in case sorrel leaves are not available to you, in such case you can add one extra tomato as my today's recipe of sai bhaaji is without sorrel leaves. 150 gms, Washed, soaked for 20-30 minutes. 2 medium size, cut in two halves. In a medium size bowl, first wash chana dal thoroughly then soak in enough water for 20-30 minutes. Drain before using for preparation. 3. Wash, cut potatoes in two halves, keep in water. 6. Peel and finely chop garlic, this we will going to use for tempering. Cooking will be done in the pressure cooker. Heat refined oil in pressure cooker, add onions, stir fry on high flame till golden brown. (This will take app 5-7 min). 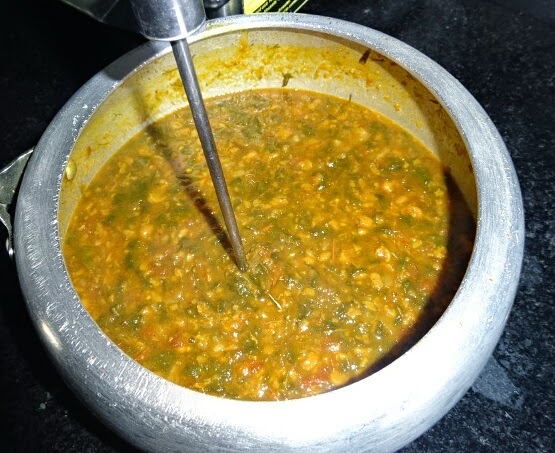 This is the most important step of sai bhaji, your onion should be stir fried with good care and caution, it should be golden brown and should not be burnt. If you can able to make judgement in this step, you will able to make best and very tasty bhaji. 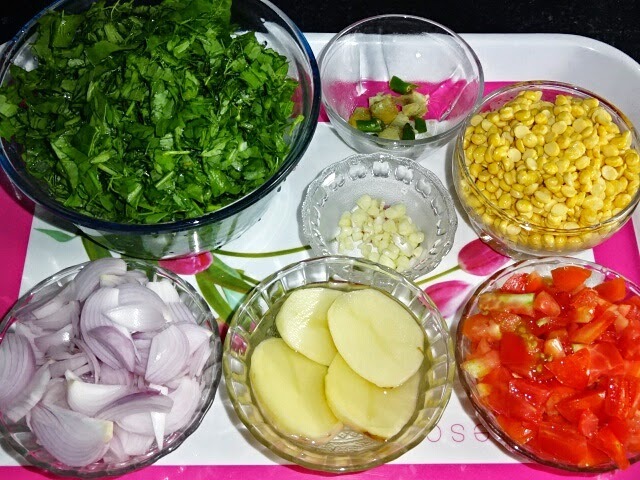 This step actually give the taste and color to your dish. 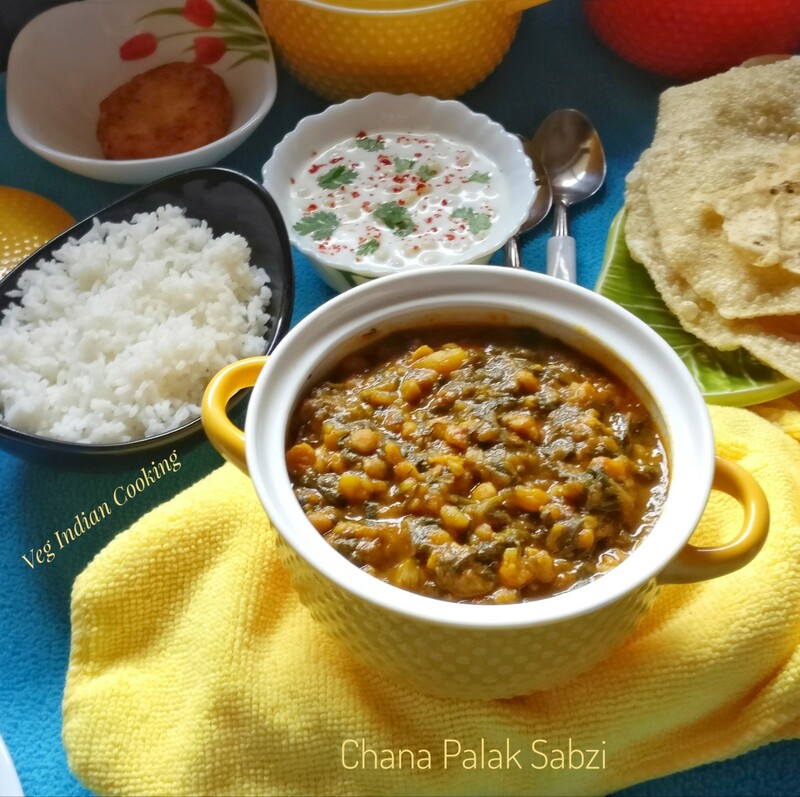 then again remaining green leafy vegetables and chana dal. 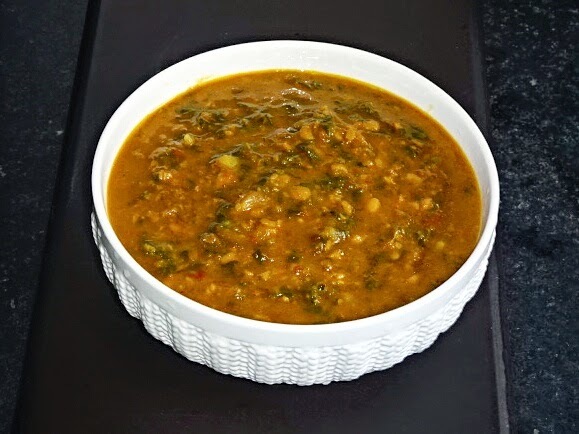 Now add all dry ingredients mentioned above and add 250 - 300 ml of water ... mix all, cover the lid and allow to pressure cook up to 4 whistles, then slow the flame and cook for 2-3 minutes. 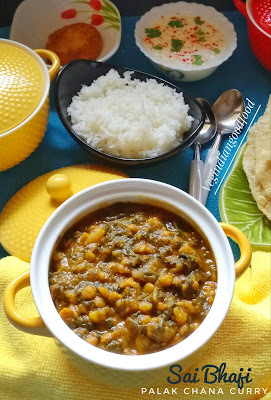 remove potatoes from the sai bhaji in the plate, mash them with help of cooking spoon and add them back in sai bhaji..
Mash sai bhaji but with gentle hands with help of masher so that chana dal is visible..
Now temper with finely chopped garlic..
Sai Bhaji is ready to be served with steamed rice or sindhi onion pulav (Bhugha Chavaran) or chappati. Wow, what a recipe and how nicely and in detailed way you narrated the recipe, hats off to you. I never come across such excellent and well arranged blog and recipes before. I am regular visitor of your blog and tried your gajar ka halwa, it turn out so yummy, with lots of good words from my husband. 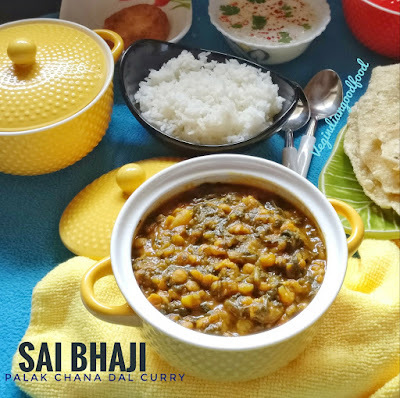 The term Sai Bhaji means green vegetables as the base of this recipe is combination of green leafy vegetables, as we mainly add good quantity of Spinach leaves. 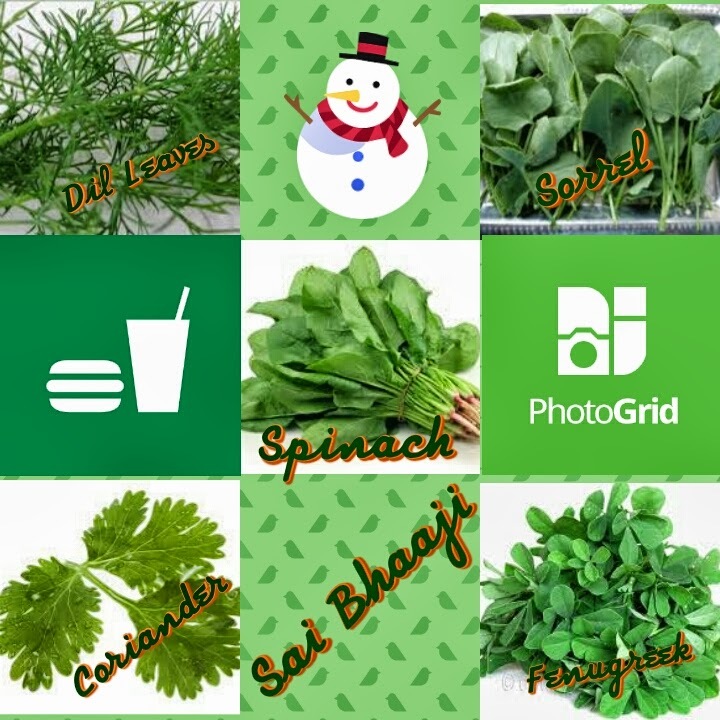 Along with palak (spinach) other green vegetables are also added such as Dill leaves, Fenugreek Leaves, Coriander leaves and Sorrel leaves. Thank you so much dear. Your all questions are always most welcome..
oh ! 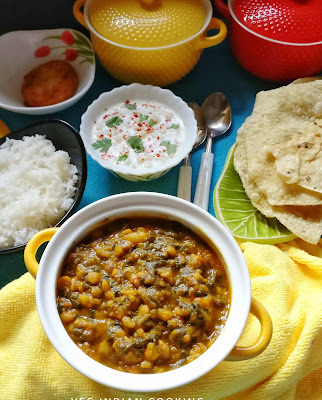 very nice recipes i saw first time your recipes but style of expressing all procedure is very nice. Awesome, perfectly made. Looking very delicious. Thanks a lot. 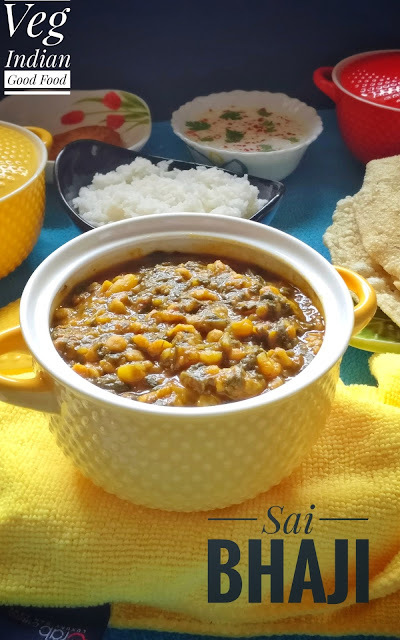 Rajma is the most popular Punjabi recipe which goes well with roti, parathas, naan and rice.